I actually started writing this post a few days ago and am only just finishing it off! Saturday night’s dinner…and sunday morning’s brekkie. You must think I’m obsessed with all things French. And maybe Italian. 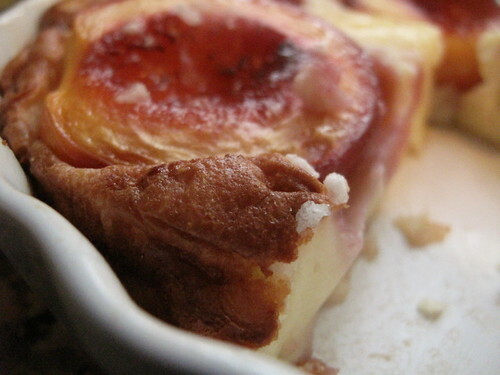 First it was the Tarte Tatin and then the Caprese millefeuille and now it’s the Clafoutis. 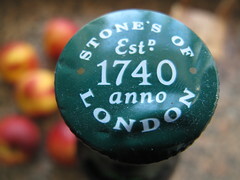 Anyway, I’m in London this week, as in right now…finishing off this post – part business, part pleasure. 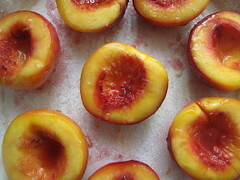 Last weekend was the one weekend I had to use up all my peaches which had been lying in the fruit basket ehmmmm since last friday evening. 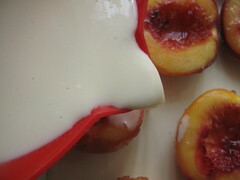 Can you tell I’ve been scheming to make a peachy dessert for a while now? 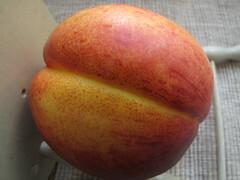 About 3 weeks ago, I went to my local supermarket – AH and they had Peaches and Nectarines on offer – half price!!!! 50 cents a kilo I think it was or something ridiculous like that. The first batch we bought were a test set and by the following day…with none left, I knew that test status had to be remedied and progress made and so I got about another…..20. 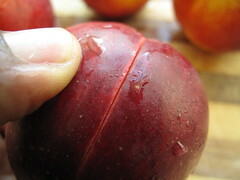 However, unlike the first set which were ripe, soft and juicy, the second set I bought (with advice from my working partner, my husband on not getting soft ones) were hard and not so sweet. That singular act was sufficient to move me towards seeking out something to do with them rather than eat them out of hand. 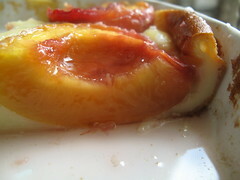 And the clafoutis recipes which have orbited the blogosphere this summer were sufficient to kick-start me. 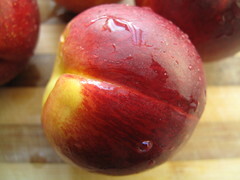 With the first chills of autumn in the air this past week, I think stone fruit are in order. Clafoutis. Pronounced kla-foo-TEE. From the verb clafir, meaning “to fill up” . 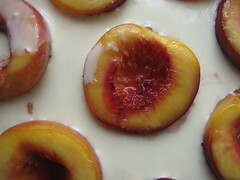 Clafoutis is a french country-style dessert traditionally baked custard studded with cherries – whole, pits and all, apparently the cherry pits release a wonderful flavor when the dish is cooked. Thats what the purists say. 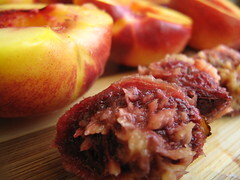 If other fruits are used instead of the cherries, the dish is called a “flognarde” (sometimes spelled “flaugnarde”). 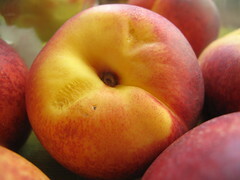 So I guess I should call this my peach flognarde. I guess it is pronounced flog nar DE! So there, you have it. And since I had a gut feeling it would turn out nice and we would eat loads – the hubby and I, I decided we would have a light main. 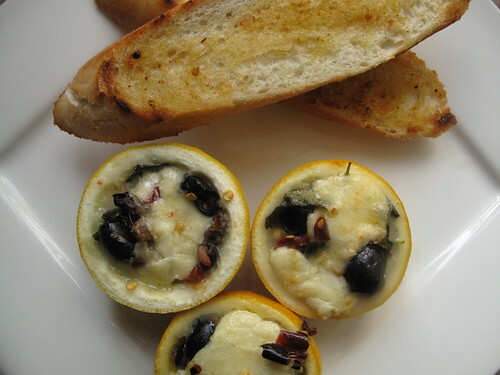 I had planned on making grill pizzas with the last of the roasted tomatoes and the mozzarella but lacked the energy to whip up a dough…even an instant one and so settled on Amalfi baked lemons (limoni di amalfi cotti al forno), a recipe from Jamie Oliver in his Italy book. 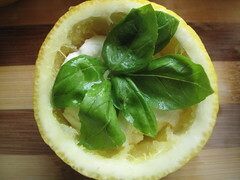 Unfortunately, I didn’t have any more of the Amalfi lemons we brought back from Rome – in February. You’d be worried if I still had them lying on the counter wouldn’t you? 🙂 Fear not, I don’t. So that was all settled – dinner and dessert. I decided they would go into the oven at the same time – if dinner was going to be lean, then dessert would have to follow soon after. And there was NO time to be wasted. (This saved me time and energy, as in gas!). I felt that the clafoutis would not be affected by opening and closing the oven as I hadn’t whipped or folded egg whites into the mix or used any sort of raising agents. 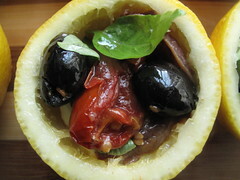 For the Baked Lemons, I decided to modify Jamies recipe to suit me and what I had to hand. 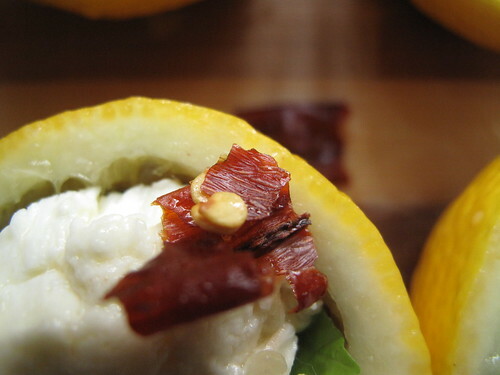 Place some greasproof paper on a baking tray and assemble lemons directly on it! I didn’t do that… I speak with the wisdom of hindsight! 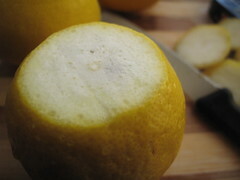 Wash and dry lemons, then slice pointy ends off the base, being careful not to cut through the base – you want the lemons to hold the juices and not have them leak away. 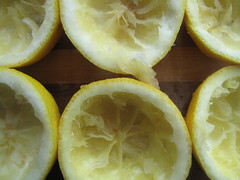 Slice each lemon in the middle to give two halves. 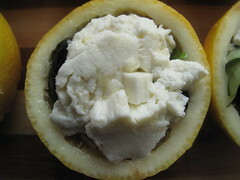 In each lemon half, place a slice of mozzarella in. Add 2 large or 4 small basil leaves on top. Follow that with 2 pieces of oven-raosted tomatoes and stud with 2 olives. 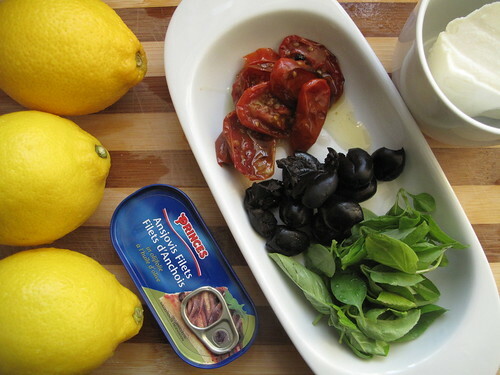 Add a sliver of the anchovies and finish off with another layer of mozzarella. 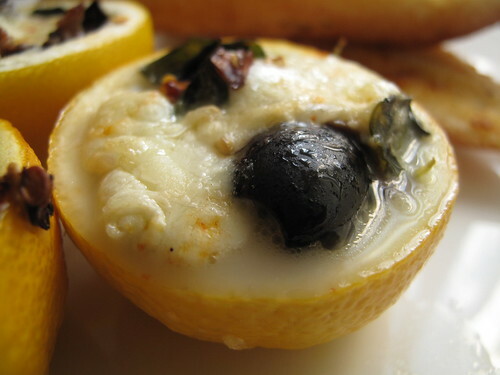 When this comes out of the oven, you’ll be stunned by the lemon freshness, moistness and melded flavours of the molten ingredients. 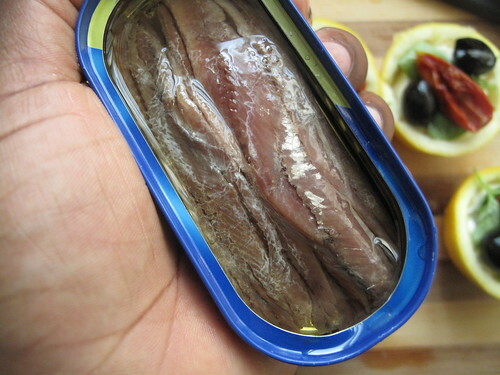 This delicious anchovies are super salty so use with care or you’ll be overwhelmed with salty fishy flavours. 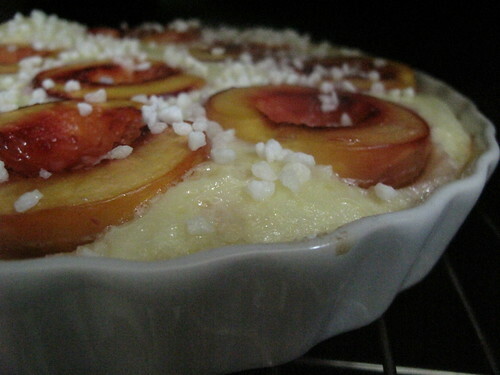 So don’t put it in the oven yet, finish off your clafouti and then bake them at the same time. 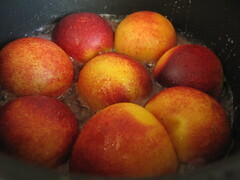 I had this flash of brilliance – to stew the peaches in ginger wine and ginger jam by mixing them together so as to infuse the peaches with heat and spice. Alas that didn’t work because of the short cooking time and the quantities I used so don’t make the same mistake please. Mix the ginger wine and ginger jam on low heat in a large pot or skillet. 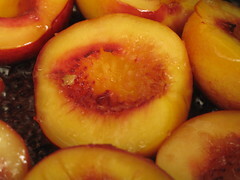 If your peaches are firm, you will need to stew/cook them for longer than if they were soft. Let one side stew for 3-5 minutes then flip over so the other side stews as well. 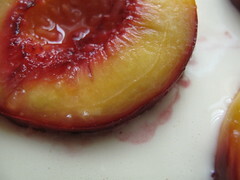 The mixture will end up syruppy and reddish after leaching some colour off the peach skins. 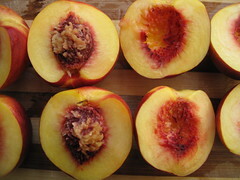 Hopefully, the peaches will be gingered but still retain their texture. Turn off the heat and set aside. Set your oven to preheat at 210 degrees centigrade (410 degrees Fahrenheit) – I try my best possible to delay heating up the oven – hate to waste gas so I leave it till as late as possible. So that’s all the reason in the worl you need to stay away from deep dishes and pans! 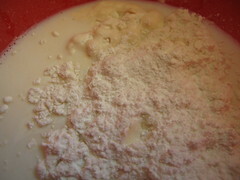 Next make the batter: Make the milk mix by stirring together the milk and cornstarch (cornstarch and flour in my case). In another bowl, beat the eggs and egg yolk (reserve your egg white for a meringue). Add the sugar and mix well then add the creme fraiche (or heavy cream) and mix again. 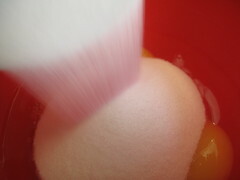 Pour the egg mix into the flour mix and whisk or stir them together till well combined. Place on a baking rack (if you don’t have another baking tray). Pop into middle of the oven. 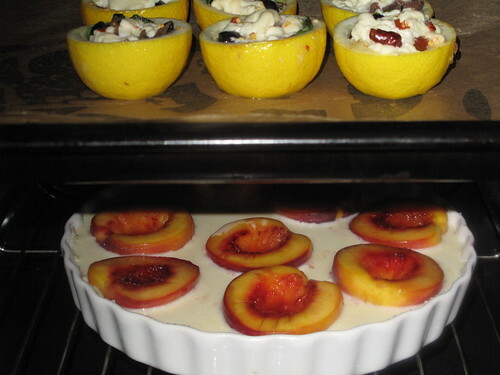 Place baking tray with lemons, two oven steps higher. 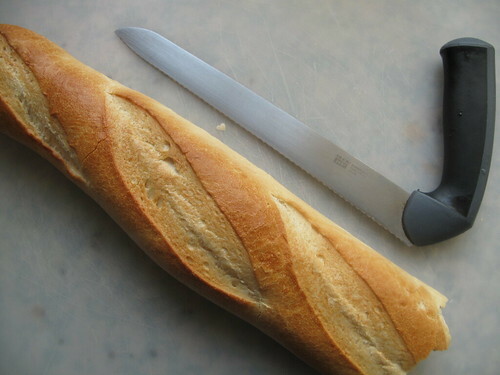 10 minutes into your baking, prepare your bread. Cut into long slices on the diagonal and brush some semi-conserva – the preserving oil from my roast tomatoes (though ordinary olive oil would do) on both sides of each slice. 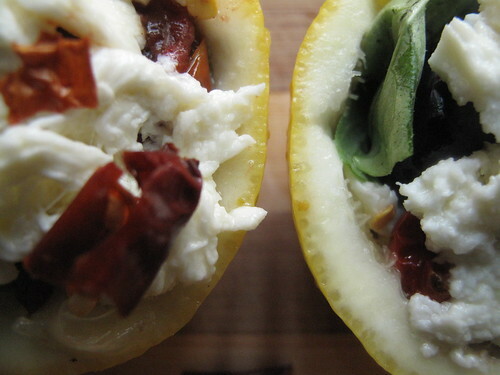 Toast in a grill pan to taste and haul the tray with the lemons out of the oven. 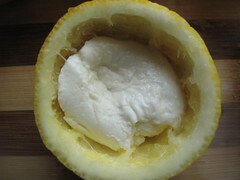 The lemons cheese topping should be soft and melted, ready to have some crostinis dipped into it. 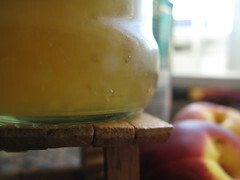 You’ll see juices bubbling and oozing – they must NOT escape. 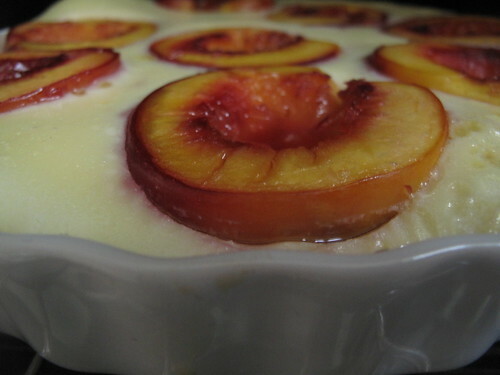 Serve up, eat and enjoy…while the Peach clafouti bakes on. 20 minutes into cooking time, have a look at the Clafouti….you’ll see some bits begin to puff up – this amazed me because I hadn’t put in any raising agents yet it had fluffed itself …I guess the eggs mustt have something to do with it. Anyway, If you have large sugar crystals, sprinkle some over the clafouti at this 20-minute mark. If you don’t have them available wait till its out of the oven and fully baked and sieve some icing sugar over it. (I got mine at G. Detou in Paris) but I know you can find them online or in some shops. I noticed various bits of batter puffed up…I was worried I’d end up with a lopsided tart but that didn’t happen thankfully. After half an hour, I noticed the edges had taken on a delicious golden brown colour – it was time to serve. By this time, the plates with the lemons had been cleared away and we were more than ready to ‘enter the dessert’. 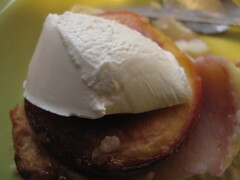 The peaches were juicy, the custard was perfect and topped with my ever present quenelle of creme fraiche. A delight. For all my bother with the ginger….it didn’t taste at all – not even a whiff of fragrance or spice. That disappointed me so I guess the next time I make it, I’ll increase the quantities and let it stew for longer than the five minutes I had it on. I know I’m repeating myself. Bear with me. I’m a crusty person – edgy too. I love the brown elastic outer crust of bread, the edges of pies, the crusty rim of pasties and….I found out I much preferred the browny outer rim of the clafoutis than the yellow creamy centre and so the next time I make this, I’ll use small, individual moulds (which I hope to while in London as I don’t possess any at the mo). 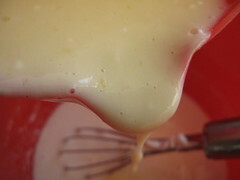 I will consider spicing/flavouring the custard – with vanilla, with ginger, with cardamoms…or with some fruit puree. I am already thinking of a mango version with coconut and lime custard but we’ll see. That may very well be when the golden leaves of autum drop or even when the icy shards of winter slice some chill into my bones. God alone knows when! And a savoury version may grace your eyes yet. Have you made clafoutis before??? How did it go? What tips can you share? Let me know. Leave a comment please.